Easter is upon us! Easter Week began this past weekend with Palm Sunday and culminates in weekend commemorations of Good Friday, Easter Saturday, Easter Sunday, and in some countries Easter Monday. Around the world, different cultures, countries, communities, and sects have their own traditions to celebrate the Easter holiday. As Catholics and Protestants gather in churches across the globe to commemorate the resurrection of Christ, people everywhere are celebrating in their own ways by eating chocolate bunnies, going on Easter egg hunts and flying kites. Here are the HuffPost's top 5 Easter traditions from around the world. Know of other interesting global traditions? Share them in the comments section below. 1) BERMUDA: Bermudians celebrate Good Friday by flying home-made kites, eating codfish cakes, and eating hot cross buns. According to Bermuda-Online.org, the tradition is said to have begun when a local teacher from the British Army had difficulty explaining Christ's ascension to Heaven to his Sunday school class. He made a kite, traditionally shaped like a cross, to illustrate the Ascension. The traditional Bermuda kites are made with colorful tissue paper, long tails, wood, metal, and string. 2) NORWAY: Norwegians have an interesting tradition for the season known for "Easter-Crime" or Paaskekrim. At this time of year, many around the country read mystery books or watch the televised crime detective series on national television, according to The Norway Post. Many families escape up to the mountains for the vacation week beginning the Friday before Palm Sunday and ending the Tuesday after Easter Monday. When spending time in a ski cabin in the mountains, a popular past time is playing Yahtzee, according to About.com. 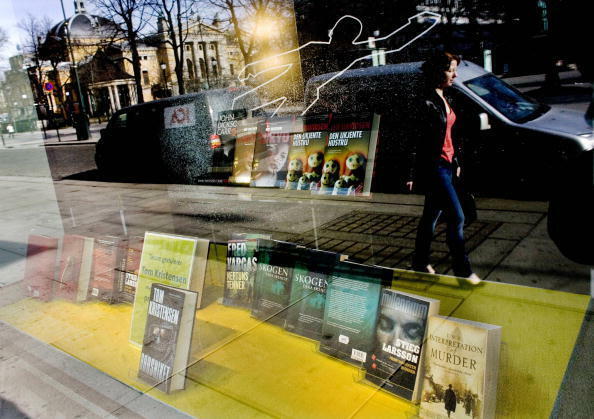 The image below shows Norwegian mystery novels in display during the Easter holiday. 3) EUROPE: In parts of Northwestern Europe large bonfires, called Easter Fires, are lit on Easter Sunday and Monday. 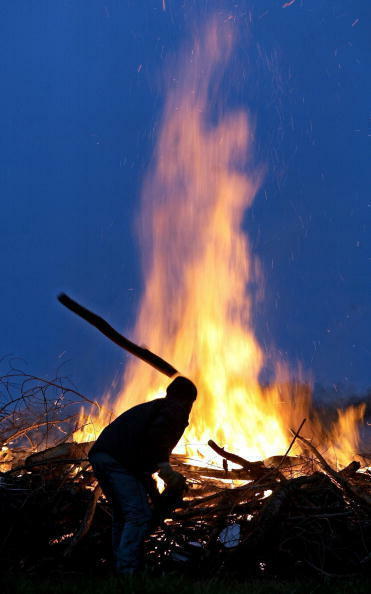 While there are various explanations for the origin of the Easter Fires, the most common Saxon tale is that Easter is a time when spring becomes victorious over winter and the fires were to chase the darkness of winter away. Today, however, the meaning of the fires is simply to bring communities together. The nights are festive with heavy consumption of gin, lager, and snacks. 4) SWEDEN: A mainly secular holiday in the Lutheran country of Sweden, Easter is celebrated with meals of eggs, herring, and Jansson's Temptation (potato, onion and pickled sardines baked in cream). The most interesting tradition to come out of Sweden is that in the days leading up to Easter Sunday, children dress up as Easter witches, wearing old and discarded clothes, according to Sweden.se. Traveling from home to home in their neighborhoods, the children trade paintings and drawings for sweets. 5) HAITI: In Haiti, Holy Week is marked by colorful parades and traditional "rara" music played on bamboo trumpets, maracas, drums, even coffee cans. According to About.com, the holiday is a mixture of Catholic and Voodoo traditions. Voodoo believers make an annual pilgrimage to the village of Souvenance. 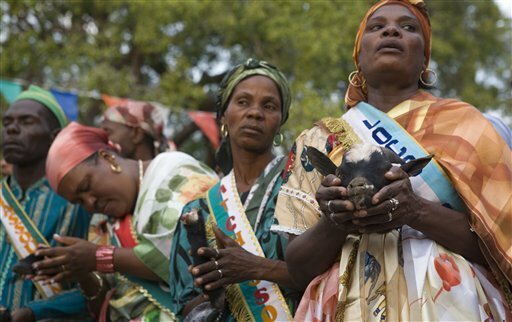 In the photo below devout voodoo believers hold a goat head and other parts, as offerings to the spirits, during a ceremony in Souvenance village, Haiti. Showing devotion to the spirits, the celebration is marked by drumming, chanting and animal sacrifices.